Did you mean: funko pop icons kfc #04 (49 items)? Trending at $29.99Trending price is based on prices over last 90 days. Funko Pop! Icons #04 - KFC Colonel Sanders - Funko Shop Exclusive! FUNKO POP! 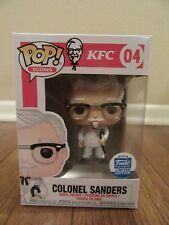 ICONS KFC COLONEL SAUNDERS FUNKO EXCLUSIVE LIMITED EDITION #04! This page was last updated: 26-Apr 05:23. Number of bids and bid amounts may be slightly out of date. See each listing for international shipping options and costs.